I know many of you have thought about becoming a personal trainer because you have reached out to me about it! I became a certified personal trainer in the spring of 2013 and I have loved it every step of the way but how do you know that being a personal trainer is the right career path for you? 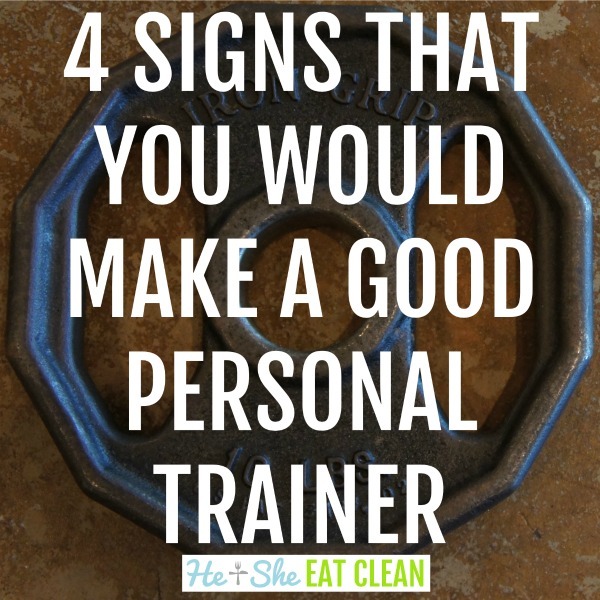 Well, besides the obvious things people think of when hearing “personal trainer” (knowing proper form and developing workout plans) below are four signs that might help you determine if you would make a good personal trainer! Looking to HIRE a personal trainer? This post with tips on how to choose a personal trainer is for you! A lot of responsibility comes with being a personal trainer. Although the actual physical work is up to the client, you must enter the relationship wanting to help them reach their goals. You only see them for a short period of time a few days a week so you have to make that time really count! You need to develop a relationship so you learn what really drives them in order to fully help them realize what they are capable of doing. Continuing education is an important aspect of being a personal trainer. You should want to learn about all of the new science, workouts, tools, etc not because it is required but because it interests you. You may have to experiment with what works for you and your clients, and not everything will be a good fit, but you should always know what else is out there. It’s important to be familiar with different styles of training because you may need to use a different style of training depending on your client’s background and goals. If you want your clients to adopt healthy lifestyle changes then you should be setting that example. I’m not saying that you have to be super lean, shredded, out lift everyone in the gym, or run a six-minute mile but you should live a healthy lifestyle. Most people don’t want a “perfect” trainer, they want someone they can relate to so if you are still on your own journey that is okay! Some people might hire a trainer to prepare for a certain event (wedding, photo shoot, competition, etc.) but many people hire a trainer to learn their way around the gym and also to motivate and encourage them. Most people just need accountability to even show up. Also, keep in mind that you might be the only positive influence someone has contact with all day if their friends and/or family are not supportive of them. Lead them and also let them know that you are there for them and, again, set that healthy example! If you are still reading you probably were shaking your head to all of the above because they describe you. That’s great because the demand for personal trainers is very high. It is expected that the employment for personal trainers will increase 13% between 2012 and 2022. Getting paid for doing something that you love and that truly changes lives is a win-win situation. Many of the trainers in the gym that I attend are part-time so you can still have your full-time job and use personal training as a way to make extra money on the side while helping people! I am a certified personal trainer and I have trained in a small studio setting but most of my training is done online (see our workout plans here). There are so many different routes you can take with personal training; train clients one-on-one, in small groups, and/or online. Please note that laws governing what you can do will vary by state. The beauty of being a personal trainer is in the overall flexibility of days, hours, clients, etc. Being a personal trainer is a very rewarding career. There’s nothing better than helping someone reach their goals and accomplish something they never thought possible. As with any career, you will want to do your research to really determine if this is the right fit for you.